Boston King, one of the pioneer settlers of Sierra Leone, was born enslaved on the Richard Waring plantation near Charleston, South Carolina around 1760. Through the age of 16, King was trained as a house servant before being sent to apprentice as a carpenter in Charleston. In 1780, when British troops occupied Charleston during the American Revolution, King fled to the British garrison and gained his freedom. King was first a servant to British officers but like many black male Loyalists he joined the British Army. He worked mostly as a carpenter but on one occasion he carried an important dispatch through enemy lines, which saved 250 British soldiers at Nelson’s Ferry, South Carolina. Later, as a crewmember on a British warship, King participated in the capture of a rebel ship in Chesapeake Bay. King was himself later captured and re-enslaved by the American Navy but managed to escape as the war drew to a close. Sometime in 1781 he married Violet, another runaway from Wilmington, North Carolina, and they both moved to British-occupied New York where he again worked as a servant. When U.S. and British peace negotiators met at the end of hostilities in 1782, the Americans demanded that the British return all American property, including former slaves. British negotiator Sir Guy Carleton, however, argued that the black loyalists were free people who had rendered service to the British Crown. Carleton prevailed and King was among approximately 5,000 black loyalists who were issued certificates guaranteeing their freedom. King, along with approximately 3,000 other black and white loyalists shipped out of New York for Port Roseway, Nova Scotia in 1783, establishing the Birchtown settlement. Boston King soon emerged as a leader, and following his baptism in the Methodist Church in 1785 he became a circuit-riding preacher in black settlements from Shelburne to Halifax, Nova Scotia. In 1791, however, Boston and Violet King decided to join the black Nova Scotians who were emigrating to the new colony of free blacks in Sierra Leone, West Africa. The Kings left for Nova Scotia in January 1792. After their arrival, Violet King died during a fever epidemic but Boston survived to become the first Methodist missionary in Africa. In 1794 King was sent to England where he attended the Kingswood School near Bristol for two years, improving his religious qualifications. 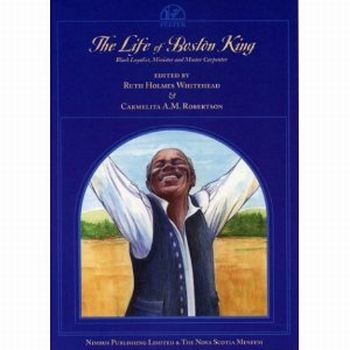 While there he wrote a memoir of his life through 1796, Memoirs of the life of Boston King, one of only three autobiographies of black Nova Scotians written between 1600 and 1900. King returned to Africa in September 1796, and around 1798 King and his second wife Peggy moved 100 miles south into the interior of Sierra Leone to become missionaries among the Sherbo people. Boston and Peggy King died there in 1802. Boston King, Memoirs of the life of Boston King (Halifax: Nimbus Publishing, 2003); Simon Schama, Rough Crossings: Britain, the Slaves and the American Revolution (New York: Harper-Collins Publishers, 2006); Joe Lockard and Elizabeth McNeil, eds. “Annotated Memoirs of the Life of Boston King, a Black Preacher originally published in The Methodist Magazine” (Arizona State University Antislavery Literature Project, n.d.), http://antislavery.eserver.org/narratives/boston_king/bostonkingproof.pdf/; James W. St G. Walker, “King, Boston,” Dictionary of Canadian Biography Online, http://www.biographi.ca/009004-119.01-e.php?&id_nbr=2489.